This honey bundt is more bread than cake. Served with fresh cream & warm sweet apples, it is perfect in the morning with coffee or in the evening! It may not seem it by the looks of the upcoming weather forecast, but summer is winding down my friends. I am half relieved, half reluctant by the sudden realization that just dawned on me while preparing this bundt. You see, I must admit, I lost track of time this month. I’ve been in an ‘early August’ state of mind, but as the saying goes, the days are long but the years are short. 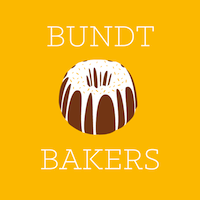 So there I was, late Tuesday afternoon, kicking up my feet after a long day of work when I referred to my calendar book- Bundt Bakers due – Thursday, August 18. I think my heart skipped a little beat. I was exhausted but had a feeling of relief, thinking I had almost gotten through the busy half of the week. 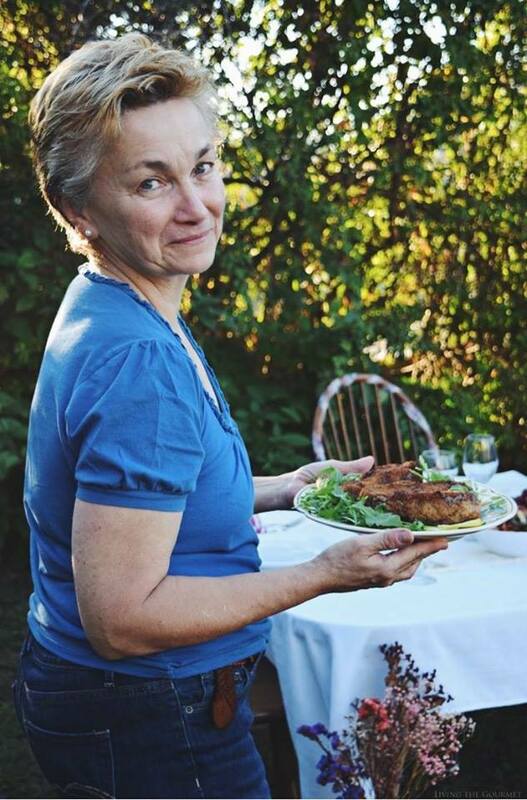 Wendy from the delightful site, A Day in the Life on the Farm is our gracious hostess this month and the theme of the month is apples. Maybe it’s because I had barely 48 hours, but I wanted this month’s bundt to be especially good. I wanted to present something different to the group. As I sat back in the chair, I wondered to myself, what if I didn’t make a bundt cake, but rather, a bundt loaf? Yes. Something light, filled with the aromas of fresh apples, sweet honey and warm cinnamon. 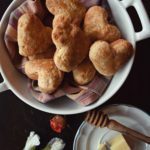 Early yesterday morning, the kitchen was filled with flour, drippings of honey over the bowl and a warm, yeasty dough on the rise. This bundt bread is a perfect accompaniment to the early mornings of the late season. I’ll blissfully sit beside the window, watching the dusty morning rays break through the hedges, with a slice of this bread and cup of warm coffee. 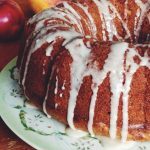 With either a dollop of fresh cream and apples or butter with jam, this Apple Honey Blossom Bundt is a delicious loaf to add to your bake list for the Fall. Soak raisins in a small bowl with the 2 tablespoons of brandy. Scald the milk in a saucepan and turn the heat off. Pour ½ cup of the scalded milk into a large bowl and let the milk cool to a warm temperature of about 110 F. degrees; then add the 2 tablespoons of sugar and the yeast. Let this mixture stand until foamy; about 10 minutes. Add the butter to the remaining milk in the saucepan and whisk. Add eggs, honey, vanilla and the cinnamon and nutmeg to the yeast mixture and whisk to blend. Add the butter mixture and whisk to blend once again. Whisk in 1 cup of flour and the salt. Stir in the remaining 4 cups of flour; 1 cup at a time. Mix in the raisins and the remaining 1 cup of flour. Using a wooden spoon, beat gently until a soft and sticky dough forms; this will take about 5 minutes to achieve. Scrape down the sides of the bowl and cover the bowl with buttered plastic wrap. Place the bowl in a warm, draft free spot until the dough has doubled in size. This process will take about 1 hour or so. The dough will be very soft and very sticky. Generously butter a 12 cup bundt pan. Going gently along the sides, stir down the dough. Drop the dough by large spoonful’s into the prepared bundt pan. Cover the dough once again with buttered plastic wrap and place in a warm, draft free spot until the dough doubles in size and fills the pan. This process will take about 1 hour. Position the oven rack to the lowest third of the oven. Bake about 35 – 40 minutes or until a wooden skewer test when inserted near the center comes out clean. Let cool on a wire rack for about 5 – 10 minutes before removing from the pan. Heat a large heavy frying pan with the butter. Add the apples, raisins, lemon juice, brown sugar and maple syrup and simmer on low until the apples are slightly soft. Add the brandy and continue to simmer on low for another minute or two. Using a thin blade knife; gently poke holes around the top of the bread and using a large spoon drizzle the syrup mixture along the top of the cake. Let the cake rest for at least one hour to absorb the syrup mixture before serving. 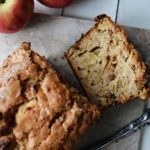 Serve with whipped cream or ice cream and the apples. Such a lovely bundt for fall. I adore the combo of honey and cinnamon. With apples is a totaly bonus. Oh this looks like such a beautiful and delicious way to welcome fall. Love the serving suggestion! This bread looks amazing. I can almost smell it. What a gorgeous and delicious way to relax with a cup of coffee in the afternoon! I bet your house smelled awesome as it baked!!! Dear Catherine, you pulled together such a lovely bundt - not only does it look stunning but the flavor of it is downright drool-inducing! 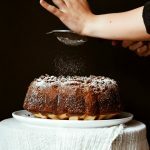 Fantastic bundt, with honey and Apple . ??? Looks delish, perfect to taste with a cup of coffee!!!! Stunning Bundt! I also made mine a mere 24 hours before posting. I love to live on edge :)) I love your flavor profile in the cake. Hmm, haven't made a bundt cake in a while. I will have to try this one. What a wonderful bread, I adore these kind of breads and could easily eat an entire one to myself . This has my mouth watering Tammy! I can't decide whether or not to be happy or sad about the end of summer being almost here. I do, however, know that I am very happy about this cake! Wonderful! It's definitely hard to believe August is almost at an end! I'm glad you snuck under the due date and made this beautiful bread. I so pinned this! Sounds amazing!! YUM! 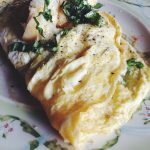 I would love for you to share this with my Facebook Group for recipes, crafts, tips, and tricks: https://www.facebook.com/groups/pluckyrecipescraftstips/ Thanks for joining Cooking and Crafting with J & J! I love that you made a yeast 'bundt' with the apple theme. I love a good sweet bread. Would love a warms slice of this to start the day! Thanks for sharing at Merry Monday!